“Philomena,” a winning new dramedy from director Stephen Frears, is a prime example of a storytelling technique known as the Trojan Horse. Like the Greeks at the gates of Troy, the film uses a genial, familiar tone and a well-worn genre to sneak in an edgy political message to an audience that might otherwise be turned off by it. It lures you in with the promise of a feel-good story, gets you to let your guard down, and then takes you to some surprisingly thoughtful places. On the surface, it is a simple and touching human interest story about a feisty old Irish woman searching for the son she was forced to give up as a teenager decades earlier. As the title character, Dame Judi Dench gives us a nuanced variation on an archetype we have to know well: the feisty grandmother. Along with Maggie Smith and Helen Mirren, Dench has joint ownership on these characters, but Philomena is one of her most rich, layered characters in years. She seems frail and a little funny at first – stuck in the past, maybe – but eventually we come to see her strength in the face of long-held pain and suffering. Here is her story: after a dalliance with a local boy as a teenager, Philomena went to a convent, where she gave birth to her child and served penance for her sins with four years of slave labor. Eventually and with little warning, the nuns sold her son to an American couple seeking to adopt. Philomena’s story, we are told, was not unusual. It happened to many young, naïve girls of that time and place. 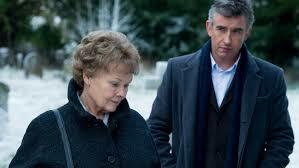 Back in the present, Philomena seeks out the help of Martin Sixsmith (British funnyman Steve Coogan), a disgraced BBC reporter and all-around grinch, who, desperate for work, takes on her story and agrees to help her find her son. The tearful reunion, he imagines, will make good copy. Coogan also produced and co-wrote the film, and his talent for comedy comes in handy. As they travel from London to Ireland and eventually to the U.S., the film gets a lot of mileage from the way Martin, a cynical and smarmy middle-aged depressive, humors Philomena, who displays a charming naivete. Still, the film is a drama at heart, and differences between the two characters run much deeper and speak to the film’s more lofty intentions. Martin is an avowed atheist who is perplexed and frustrated by Philomena’s faith, particularly in light of the trauma her religious leaders inflicted on her. Philomena, on the other hand, offers only excuses and forgiveness for those who have wronged her, and is undeterred by her traveling companion’s condescension. But as the plot thickens and the crimes of the nuns grow even worse in retrospect, Philomena’s faith is eventually challenged. The film never stoops to favoring one character’s viewpoint over the other – or arguing in favor of Sixsmith’s atheism – but it raises a number of important questions about the distinction between personal faith and organized religion. Some have viewed it as an attack on Catholicism, but it struck me more as an earnest attempt to offer Catholics a venue to emotionally process some of the sins of its past. For some, the juxtaposition of gentle political criticism and heart-warming granny story might be jarring, but the winning performances smooth over any of the film’s rough edges. It is easy to take Dench for granted these days, but it is impossible not to be impressed by her unique, complex take on what could have been a stock character. Coogan, however, is the real revelation: his character is the audience’s entry point into the story, and he undergoes the larger transformation. Martin is cynical and depressive, but also funny and likeable, and it is easy to go along on his journey with him. It is a journey that you’ll find worth taking. “Philomena” is the kind of warm-spirited movie built for the holiday season, but it’s also much more. See it with family – you’ll have plenty to talk about afterwards. This movie didn’t quite work as well with me as it seems to be with everybody. All problems I had with the themes and the message aside, the tone was all-over-the-place and never quite knew if it wanted to inform us, warm our hearts, disgust us, make us laugh, or try to tell us an honest-to-God’s story of an old, daft woman. It tries to have it all ways, but it just can’t. Good review. Yeah, it was a mish-mash, but it cohered enough for me, thanks to the performances. I understand why it would not be everyone’s cup of tea.